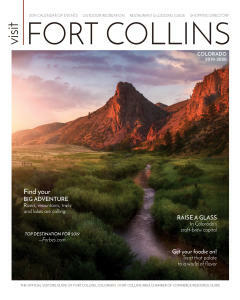 Fort Collins has been named one of the Top Places To Visit In The US in 2019. As TripAdvisor put it, "Surrounded by picturesque mountain peaks, Fort Collins is a charming town full of local pubs and dining spots, boutiques, and endless natural beauty. Visit Cache La Poudre River for a simple photo-op, a hike, or even a whitewater rafting adventure! Fort Collins has been affectionately nicknamed “the Napa Valley of beer,” and for good reason." Fort Collins is situated at the foothills of the Rocky Mountains, just an hour north of Denver International Airport. The Choice City prides itself on its fabulous recreational opportunities, diverse cultural attractions, vibrant nightlife, dining scene and family fun activities. Are you looking for exciting things to do? We encourage you to come experience world-class whitewater rafting on Colorado&apos;s only nationally designated “Wild and Scenic” river, the Cache La Poudre River (the best whitewater rafting near Rocky Mountain National Park). Or, feel free to indulge yourself by tasting award-winning craft beers at one of our 20-plus local breweries. We also encourage you to explore our unique local attractions and to stay in the know with our calendar of events. And, if you are looking for a place to stay, please check out our wide range of choices of hotels, B&B&apos;s and hostels. Fort Collins is widely known for its beautiful historic downtown district. Did you know Walt Disney actually used the downtown area as inspiration for the look of Disneyland&apos;s Main Street USA? We’re proud to say that Main Street USA is modeled after our own Old Town Fort Collins! We have always ranked highly on lists of towns that offer exceptional outdoor adventures and access to excellent recreational facilities. Whether you&apos;re in Fort Collins for a weekend or a couple of weeks, it&apos;s nearly impossible to explore all of the trails, lakes, and streams in the surrounding foothills and mountains. As the base camp for your Colorado adventure, Fort Collins provides you with big-city offerings and the amenities of a Colorado mountain town. Camping, fishing, hiking, bikingand exploring state parks and natural areas are all encouraged on your visit to Fort Collins, which plays host to Arapaho and Roosevelt National Forests and the spectacularly beautiful Horsetooth Reservoir. Come find out why Fort Collins was named a top spot to travel to by TripAdvisor. We promise you will not be disappointed.